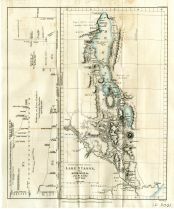 Title: (South Eastern Africa) Lake Nyassa, the River Shire & c.
Sub-Title: from the M. S. Map by Dr. Kirk. Notes: Associated with book ID 572. On the left border, outside the neat line, there are the longitudinal profiles of the River Shire and of the River Zambezi from barometric observations. There is also the Gradient on River Shire, by Dr. Kirk, 1860. On the center bottom of the map, outside the neat line "Published for the Journal of the Royal Geographical Society by J. Murray, Albemarle Street, London, 1865."